Should I keep my server opened? In less than one month, my host is going to expire and I'm not sure if renewing it or not (I'm not looking for free hosts either so don't suggest me that). My server is nothing special I'm aware of that hence its name, but considering the small amount of servers this mod has, I'd like to hear some feedback if I should renew the host or not. I won't necessarily renew it if YES wins over NO, but surely I'll be more motivated in case I decide to. Please feel free to share your opinion along with the reason behind your vote. as long your server has zero anti cheats it will be nothing but party place for hackers, crashers as it is right now, and theres already enough of these in lu. Awe, well Worst server was an off spring of mess about, so I find that sad. Your server has always had what other servers don't “The old school feel” From killing a player and taken there weapon, To flying across the map, To changing your vehicle colors. I always wished to see a bigger update, for example Money pickups after death, the small things that the older servers had like your server a long time ago.. I do not intend to get personal what so ever but could you consider lowering your player count to 8 players? This will lower the price and LU is not that high populated. I think I had 4 months for 3.50 USD. And I only seen at the most 7 players on your server all at once within the past 4 months. 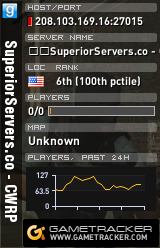 I would really like to see the server stay around. If anything if you do not intend on updating your host could you possibly port it again one day in the future for fun? Why not move to another affordable host and put some focus into the issues people mentioned? Every fun, unique server out there helps the mod grow again. motley your server version was 0.1.0.16 and i can't play in your server because my client version 17 can you update it? My server will stay in 0.16 version, I don't play on upgrading due to the memory check kick. I'll be waiting for 0.18 version I guess.